Hard Wear Bullet Accent belt features gun bullets accented near each end of this belt so that ammo is features on the sides while it is solid leather on, the front and back. 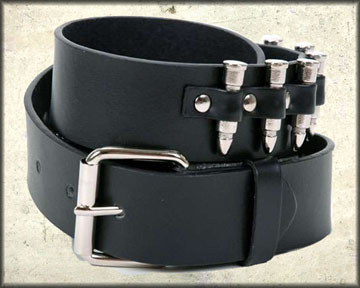 This belt includes silver metal buckle that is removable and can be swapped with any belt buckle. Bonded Leather, 7 Belt Holes For Adjustable Fit, Belt Width 1.75". Sizes: S/M (30-32), M/L (34-36), L/XL (38-40) XL/XXL (42-44). Color: black.